Having bad skin can be difficult to live with. Problems like skin tags, warts, blackheads and moles as well as signs of aging can be annoying and make it hard to live a normal life and have success socially. There are more than three thousand different skin orders that people can suffer from, and these are just a few. Skin problems can be caused by everything from infection, inflammation or an allergic reaction as well as bacteria and other problems. But these particular skin problems can actually be helped by natural cures with great success. Here are some treatments for these particular skin issues. Moles are pretty harmless. They are black or brown in color normally, and are a collection of melanocytes or pigment cells. 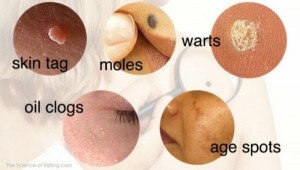 You do always want to make certain that your moles aren’t cancerous before you try natural treatments on them. Home remedies for moles include garlic, apple cider vinegar, castor oil and warm water and an emery board is a great way to prepare moles for these treatments. Some people call these liver spots, and they are usually brown and appear on the neck, back, shoulders, hands, face and other places. Sometimes they are caused by sun exposure or genetics, but usually, most people get them at a certain age. Lemons can help with this problem as well as aloe vera, onions, horseradish and sandalwood. You have probably heard that acne problems are often caused by clogged pores. Our skin secretes sebum oils which can stick to dead skin cells. Usually, these cells get removed through the pores and that makes our skin look healthy. But when you have clogged pores you have skin problems and that’s exactly what these natural cures are able to treat. You probably already know that apple cider vinegar is a big one, as well as ice, egg whites, sugar scrub, baking soda and multanimitti.